1. Put 2 cups flour into a large mixing bowl. 2. Cut butter into small pieces. Make a hollow in the center of the flour and add butter. 3. Rub butter into flour with your fingertips until mixture looks like large bread crumbs. 4. Mix salt into water. Add enough water, a little at a time, to flour mixture to make a firm (but not stiff) dough. 5. Knead dough in bowl for about 5 or 10 minutes. 6. Cover bowl with a damp cloth and let stand at room temperature for at least 1 hour. 7. Divide dough into 1-1/2 inch pieces, and roll each piece into a smooth ball. 8. Sprinkle remaining 1/2 cup flour onto a flat surface. 9. With a rolling pin, roll out each ball until it resembles a thin pancake. 10. [Try not to incorporate too much extra flour into the chapati - it makes them tough. 11. ] Heat a heavy skillet or griddle over medium-high heat. 12. Place one chapati in the center. 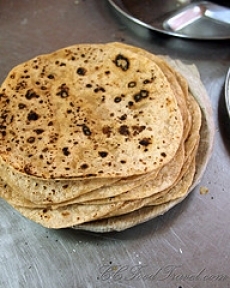 When small brown spots appear and the edges begin to curl up (in about 1 minute), turn the chapati over with a spatula. 13. Cook chapati for about 2 minutes or until small brown spots appear. 14. Wrap the cooked chapati in a towel to keep them warm. This recipe contains potential food allergens and will effect people with Wheat, Butter, Gluten allergies.